If your kids are anything like mine, by this time of the summer, they aren’t interested in going out to the backyard and playing. It’s hot. Everything that was exciting at the beginning of the summer is boring now. They need some incentives. It’s hot, but maybe your kids are tired of their traditional sprinkler. 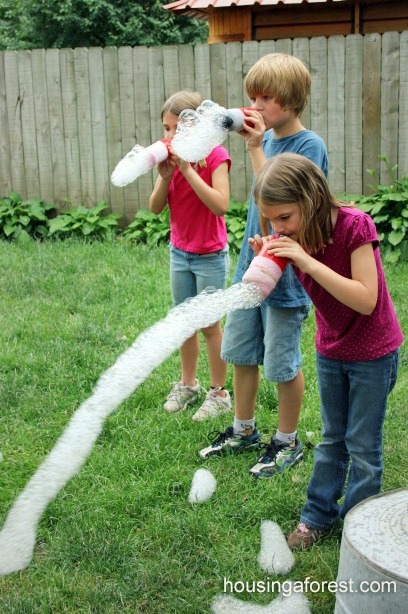 Build this cool Kid Wash/Sprinkler out of PVC pipe. Merge science and water play with this one. 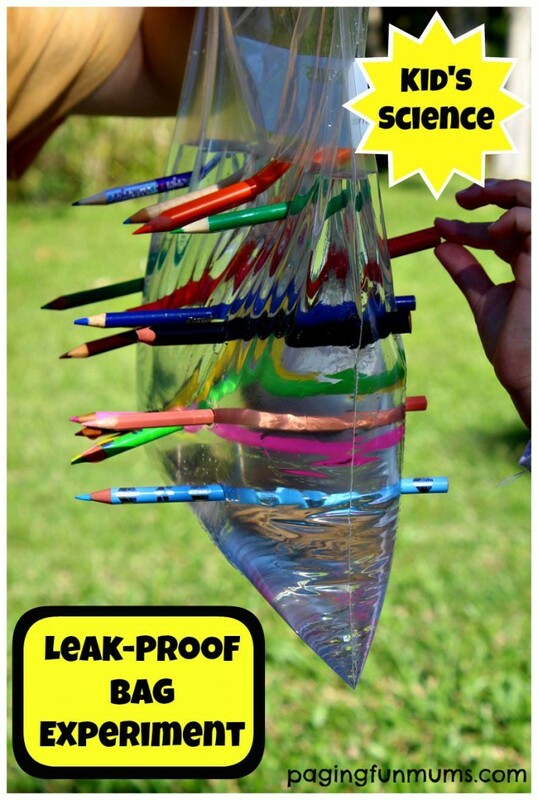 Make a leak proof bag with only three items surely found in the home. This may look like science, but you know in the end it’s going to turn into fun and wet horseplay. It’s a great mix of education and silly time! 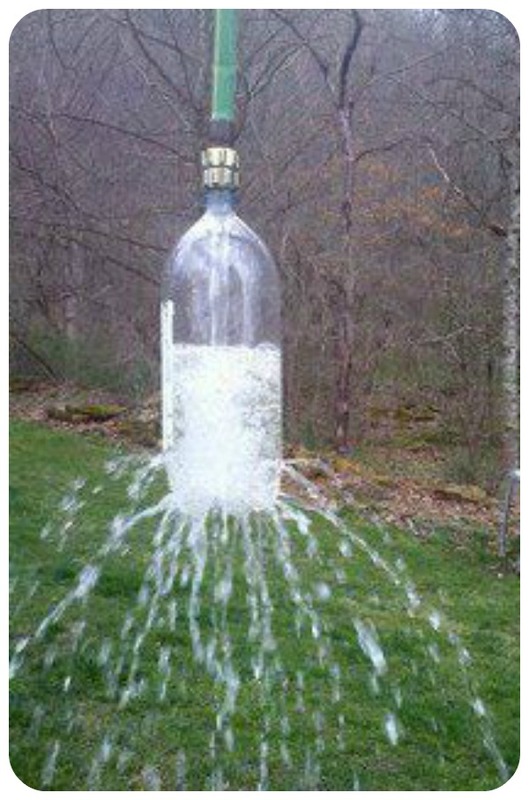 Speaking of silly time, check out this homemade sprinkler. Just dig through the recycling bin for an old 2 liter bottle, poke some holes, attached it to the water hose and toss over a tree branch. The kids will have a blast putting this together and then splashing around in a new DIY sprinkler. This idea is for a water birthday party, but it doesn’t have to be a special day for water balloon pinatas. 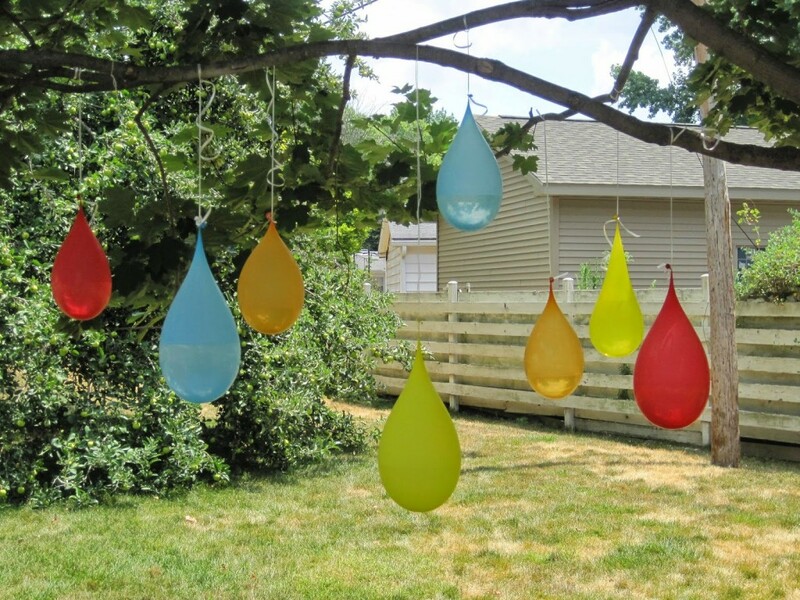 String up these water balloons and celebrate summer with a splashing, pinata party any old afternoon. This next idea will go great with your Kids Creations play set. 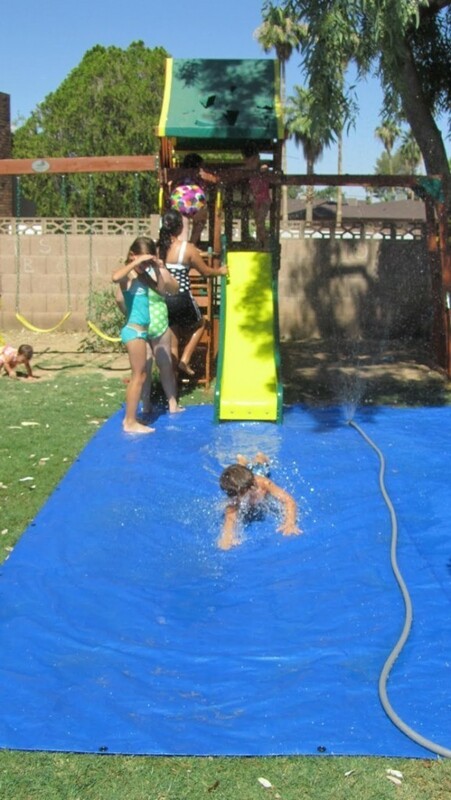 Get a sprinkler and a tarp and make an awesome water slide. 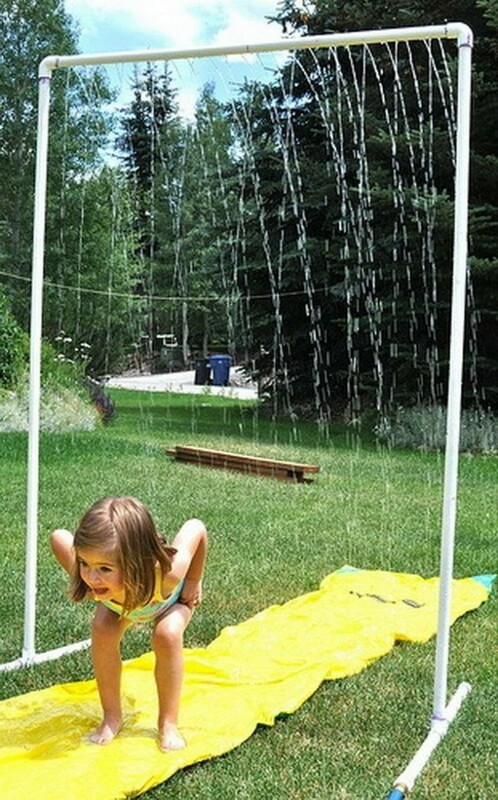 You won’t even need to take your kids to a water park this summer if you set this up! Aside from water play, there are other easy ways to get your kids outdoors. For instance, take a squirt bottle and something colorful, mix together. Your kids will get hours of fun in the sun. Mix together equal parts cornstarch and baking soda. Fill the squirt bottle approximately 2/3 full of this mixture then add a few drops of food coloring. Fill the bottles the rest of the way with water. Mix. Fill separate bottles with vinegar. After the kids use the paint on the sidewalk, then you can use the vinegar bottles to “explode” the paint. Double the fun! Cut the end off the water bottle. Slide the sock over the end of the water bottle. Use the duct tape to secure the sock (can use a rubber band, as well). Pour dish soap into a small dish with some water. Add the food coloring if you have it. You can also add food coloring to the sock. This can be a little messy, fyi. Then just blow the other end. Fun, fun, fun! 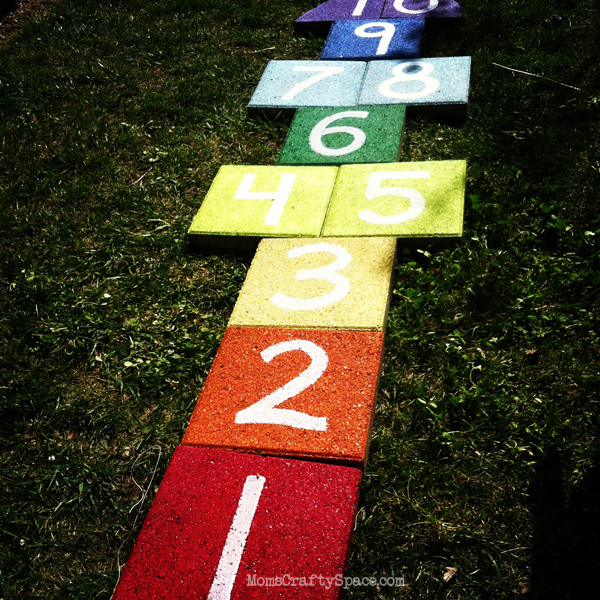 Classic games like hopscotch can add a new twist to your backyard with these pavers. Paint permanent hopscotch and install it in your backyard. Get the kids involved in the painting and you’ll have a load of backyard fun with these. Speaking of classics, does this bring back memories for anyone? 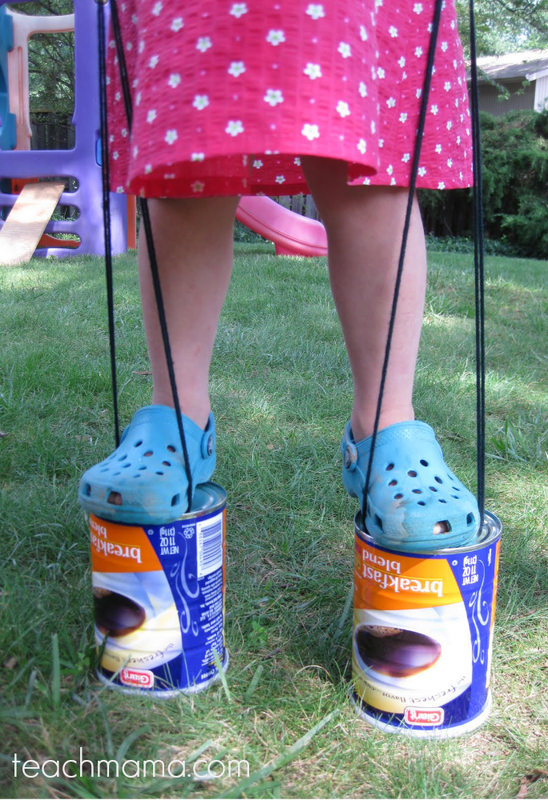 Coffee can stilts. This is totally retro. Some kids need more inspiration and less perspiration. For those kids, playing outside takes a little more creativity. 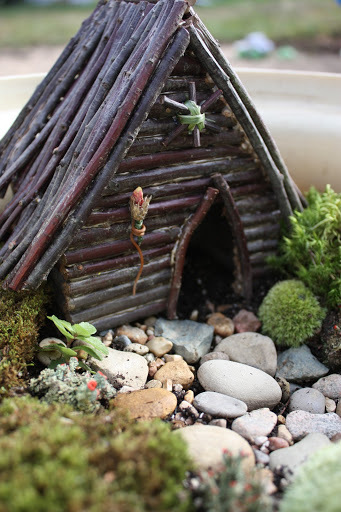 Craft this charming twig fairy house for hours of imagination. While you’re at it, be sure to follow our Fairy House board on Pinterest for more fairy-inspired ideas! 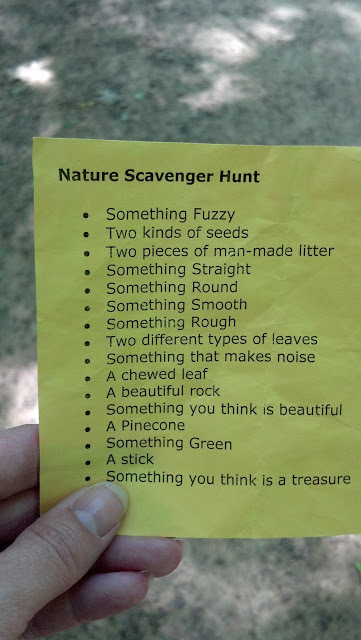 Appeal to your kids’ detective side, oh yeah, kids love a good mystery, by having a nature scavenger hunt. 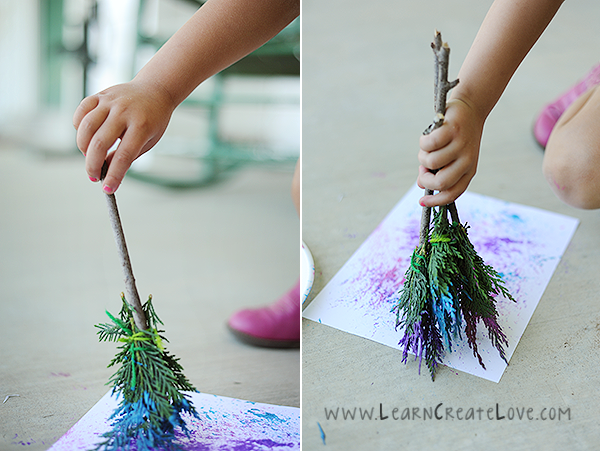 Make natural paintbrushes. You can do this with just about any leaves, attach them to a stick with some yarn or string. 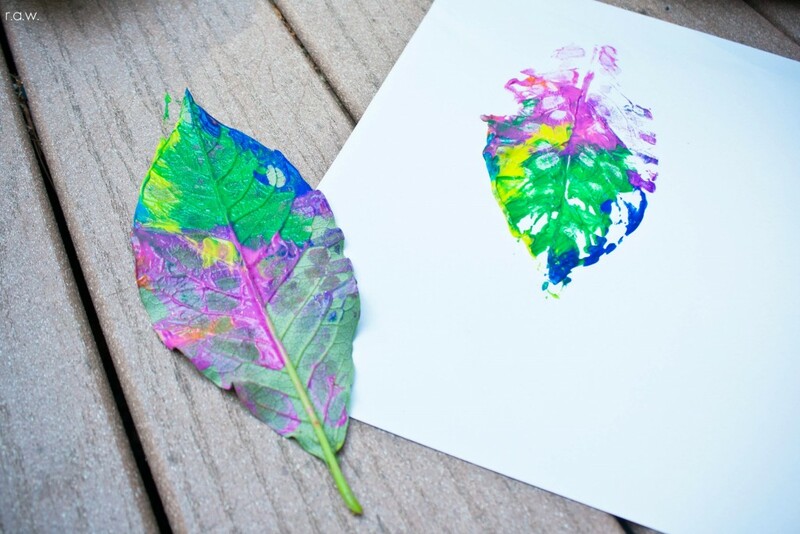 Make leaf prints. You can find the leaves in the scavenger hunt and use the sidewalk paint! 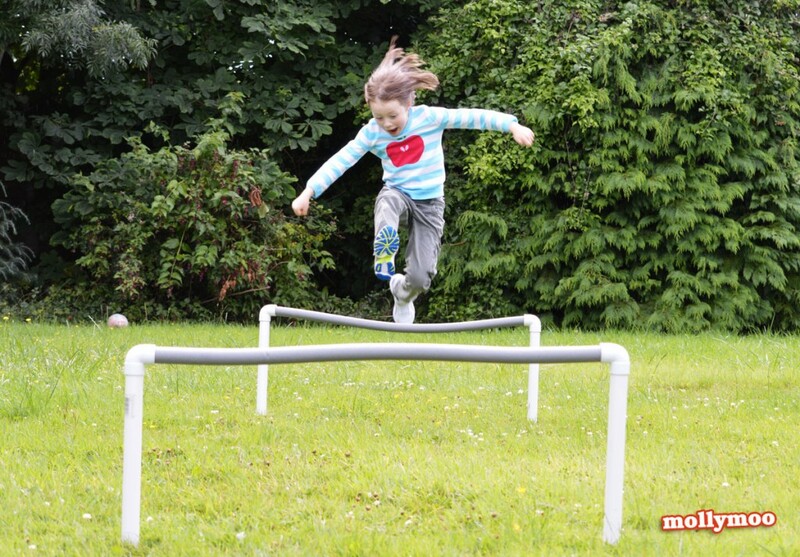 Get kids moving with this DIY obstacle course. PVC pipe is so versatile! I’m thinking, add some tires to it and your kids will be able to have their own boot camp! 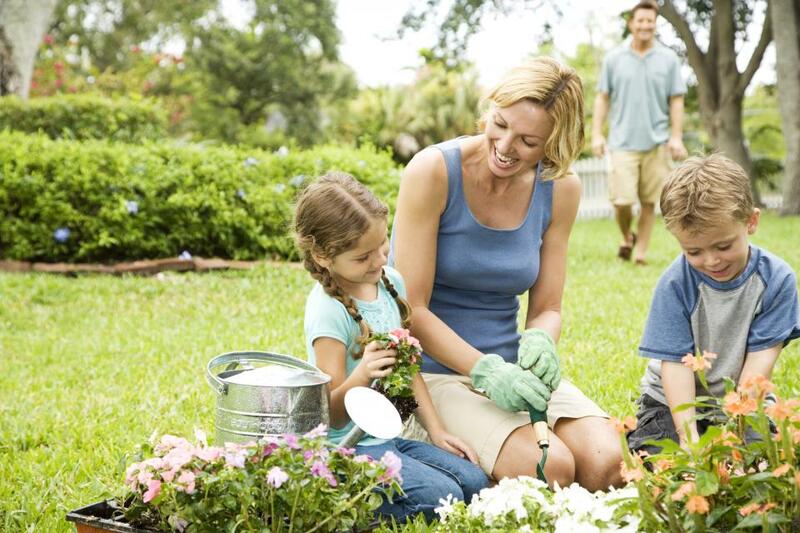 Finally, one of the most creative and productive things you can do with your kids is to plant a garden. Be sure to check out the Kids Creations Pinterest board on Gardening with Kids for loads of great ideas! There are tons of ways you can get your kids active and playing outside. Sometimes it takes a little ingenuity, but kids genuinely like playing outside when they have an engaging activity.